Governor Ducey’s vision for Arizona depends on a strong, innovative economy supported by healthy citizens living in clean, safe communities. Whether you’re a city dweller or live far from the hustle and bustle, a healthy Arizona delivers peace and prosperity for all, including our most vulnerable, with a rich, sustainable natural environment of clear skies, clean water and lands to safely roam, work and play. In the fall of 2013, an investigative report revealed serious deficiencies in the time it took for newborn screening bloodspot specimens to be submitted for testing at the Arizona State Public Health Laboratory (ASPHL). The data revealed that 33% of the initial bloodspot specimens took longer than 3 days from time of collection to receipt at the lab. Delays in the transit time of bloodspot specimens can contribute to irreversible negative health outcomes for a newborn such as brain damage, various disabilities, and can potentially be fatal. The Arizona Department of Health Services (ADHS) Director announced this finding as an Agency priority and established the Newborn Screening Transit Time Taskforce. The team was tasked with a statewide goal that within six months (by July 1, 2014) the taskforce would transform the specimen transit process to ensure 95% of newborn screening specimens collected at birth hospitals would be received at the ASPHL within three days of collection. The taskforce collected data and determined several issues that were contributing to the delay in delivering the specimens. In some instances, hospital staff were not aware that a courier service for newborn screening specimens was provided by the ASPHL, free of charge. As a result, hospital staff took what they considered to be cost saving measures by batching multiple days of specimens prior to shipping which resulted in undue delays. Additionally, the current courier pick up schedule did not provide service on weekends or holidays. This gap in service delivery created additional life-threatening delays to newborns born on holidays and midweek. It was also determined that the courier service did not consistently provide pick up services at hospitals with low birth volumes. Further delays were created by the frequent turnover in hospital staff. High turnover rates, poor internal communication and deficiencies in new-hire training, created a lack of understanding of the newborn screening process, including necessary compliance with regulatory time limits. In addition, hospitals did not effectively evaluate their internal systems to ensure standardized processes were followed to efficiently manage specimens from the point of collection to shipping. Lastly, the ASPHL did not provide hospitals with performance reports or metrics for specimen transit time. After identifying the issues, the taskforce developed targeted solutions focused on increasing the courier service capacity to the 43 birth hospitals in Arizona, creating a performance metric, facilitating transparency, and providing educational opportunities to hospitals. 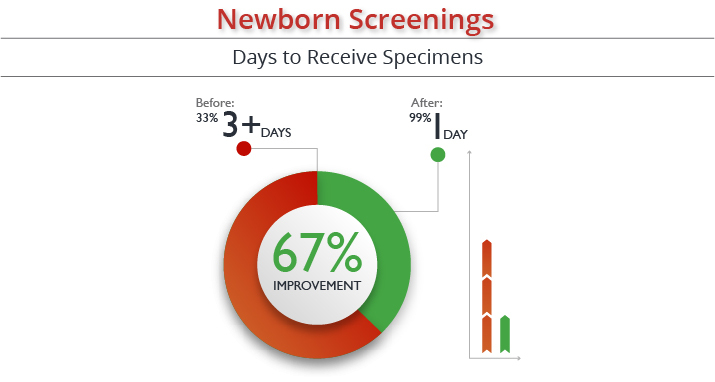 Within five months, 99% of newborn screening specimens collected at birth hospitals were received at the Lab within one day of collection. These improvements are all due to the initiatives focused on commitment to statewide transparency, accountability, and increased partnerships. As a result of the collaborative efforts, ADHS received the first ever Quality Improvement Newborn Screening Award from the March of Dimes in September 2014.